A couple of months ago I was invited to speak at the Academies Show in London on the subject of assessment for children with SEND. It was very exciting (and flattering) to find such an email in my inbox, so I duly went and asked my boss if I could go (it was on one of my working-at-work days). He duly rolled his eyes at me in the manner of long-suffering bosses and very kindly gave me permission. So yesterday I boarded an early morning train, travelled the length of London and out the other side, and went, clutching a memory stick with, rather than a bunch of statistics and graphs, all the better to impress the movers and shakers in the education world, a small selection of family photographs. Being a teacher, and one who works directly with children, as opposed to a school leader, and being a parent of a child with significant SEND (Down’s syndrome) gives me a different perspective on the matter and this is what I said. Including children with SEND in mainstream schools is important, and for many reasons. Not just educational ones, but emotional and social ones too. Having differently-abled children being educated together breaks down the very real barriers of fear that exist around disability, when it is done well, and this is important work. It is vital, however, that we remember that this enterprise, that of inclusion, is not about us, but about setting our children up, no matter what their level of difficulties, with the skills and knowledge that they will need in order to make their way in adult society as independently as possible. I showed everyone a picture of my son doing his volunteering for his Duke of Edinburgh’s Bronze Award, and reminded them that a young person working, making a contribution, having the dignity of a fully adult life (which includes working) was what we were aiming for, as far as each child is able. In schools, it’s terrible easy to fixate on the short term, on the exam results and attainment data, and forget what it is that we are really doing – preparing our young people for life. 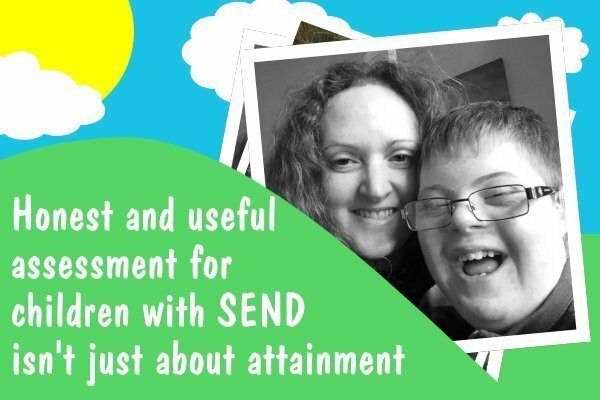 And in order to do that, we need our assessments to be both honest and useful – and where SEND is concerned, we need to look more broadly at what this means. Rather than focusing on academic attainment measures (the ones that give us the pretty graphs with which we can dazzle inspectors), I focused on a couple of other areas that, to me, hold equal importance and without which, children find it difficult to learn. The first, and to me, the most important, is social development. Many children, my own included, have difficulties socially, and some children need to be taught social skills explicitly. And, to be honest, it isn’t only the a-typical who find it hard to settle in a classroom if they are worried or upset about the social world they are inhabiting. Recognising progress in this area is absolutely key for many children - and has a direct impact on their ability to learn. The picture I used to illustrate this aspect of learning was of my son at a recent birthday party. I pointed out that, since he started at his special school, he has been to far more birthday parties, and and has far more meaningful friendships than he ever did at mainstream. To be honest, this simple fact is, in itself, worthy of thought. Next, I talked about physical development. A characteristic of Down’s syndrome can be low muscle tone, and when my son started school, he still had to learn how to run efficiently, how to catch a small ball, use scissors, scribble – and bend his knees when he jumped. He had, and still does have to a degree, a low appreciation of danger. Self-care, in the form of toileting successfully, getting himself dressed and undressed for PE and swimming, and keeping himself clean and tidy after lunch are all important parts of growing up, and many included children may well be on a different point of development than the typical school child at any given point in time. You might not be able to get an 'A' in How To Use A Napkin (or serviette, I can never decide which is posher), but being able to use one sure as hell makes a difference. Many children with SEND also have associated health needs – and these form part of the picture too (and a very important one). And finally, attainment. We need to remind ourselves, as a profession, that SEND is not necessarily about attainment in the classroom. Some children make very significant strides academically – and yet they still have additional needs. Others, like mine, do not; their progress comes in other ways and needs to be recognised. After all, children are not at school to be patted on the head with the accompanying soft smile of the Poor Dears mentality. They are there to be educated, and that education needs to be useful to them. Above all, the assessments we make as teachers need to be relevant and meaningful – and that means paying attention to all of these things. For too long, it has been tied too closely to accountability and this has meant that the teacherly eye has been taken off the ball, fixed on the inspector and the league table, rather than on the needs of the child. As a profession, growing a bit of backbone and reasserting what is useful to us as teachers and meaningful to us as parents, would be a change most welcome. It is always worth remembering that we, both educators and parents, are working towards the moment when our children leave us to pursue lives of their own. Maybe the world of SEND can be the agent of change that makes schooling better for everyone. Nancy is a SEND teacher in a mainstream primary school and writes about issues relating to teaching and parenting. Nancy's eldest son has Down's syndrome. Her blog, "A Not So Ordinary Diary" won her the TES Teacher Awards Teacher blog of the year 2015. It’s back! ASK IPSEA on SNJ is relaunched- let the questioning commence! SNJ’s new service: EHCP Transfer Clinic! Going back to tribunal and looking for resource on what standards SEND schools need to follow. They say that they can meet a childs needs, as per the EHCP, then do their own thing. no collaborative working with parents, no transparency, no meaningful communications. I like this article as the education needs to be functional and meanign to the indvidual and differentiated to the individuals preferences and interests. But what I find most pertinent and meaningful in this article is reference to long term outcomes. Currenlty the DWP pratices mean that sick and disabled people are denied support and a large number of them die within a short space of time and some as a direct result of the conditions they suffer due to poverty. How can any of us be comfortable in a society where the send schools get to set their own target, can ignore the ehcp outcomes and the provsion to meet them, and for many are little more that a fair babysitting service. To love and care for my children is to give them the support that they need to achieve an independent future where they are not at the mercy of the state. I dare anyone who works with my child to say how much they care, and how they can meet his needs, when they are not putting in the provision stipulated in the EHCP and analysing progress against outcomes to see if the recourse is still suitable to meet those outcomes. When a school relies on the ofstead report only to tell you about the school its a worrying trend. Where is the success that they have and are havign with a child likemine. where is the evidencee that they are keeping up with developments in educating and supporting children like mine. In terms of understand SEND and certain conditions we have come a long way in teh last , 30,20, 10, 5 or even the last year. to say someone has experience with a child with my child conditions or actual being, is not appropriate. what is needed to be known is how they are going to develop, differentiate and keep up to date with how to support my child with his fruit salad of needs. the ofstead report talks about behaviour, but not the principles and practices and frameworks of supporting children with that. where there is s school with such a diverse set of needs, where is the analysis of how they are at supporting those particulars needs and where is the documentation and data to support that. When they talk about the most complete, and my all time favourite (not) least able, what is the criteria, and why is a school struggling here yet still be able to get a “good”.